Who will provide capacity at Richards Bay? 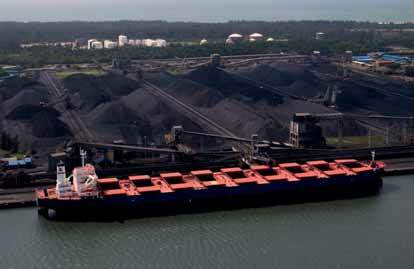 Both Richards Bay Coal Terminal (RBCT) and newcomer RBT Grindrod wish to install additional coal export capacity at the port of Richards Bay. Both also seek to work with Transnet as main partner. However,Transnet is also exploring the possibility of building its own terminal in the port. Not all planned projects could be implemented, since this would result in overcapacity. It is believed that RBCT has certain cost advantages over rivals, since it already has berths and rail access in place, thereby ensuring that the capital cost will not be so high. Nevertheless, this will not necessarily mean that RBCT will win out, since Transnet is under pressure to provide access to the export market for emerging black mining companies, which is why RBTGrindrod believes it is well placed, too. Its senior executives argue that the proposed 19- million tonne expansion under Phrase 6 expansion of the terminal should include new entrants and, if Transnet agrees to partner it, this would become a reality. Transnet’s own plans only envisage increasing the flow of coal by rail to 81mt (million tonnes) a year by 2018 and it is not clear when this will be raised to 91mt a year, or, indeed, to 110mt a year. Existing RBCT shareholders are said not to want to surrender any capacity at the port to smaller rivals until Transnet is able to guarantee it can move 91mt annually to the port.